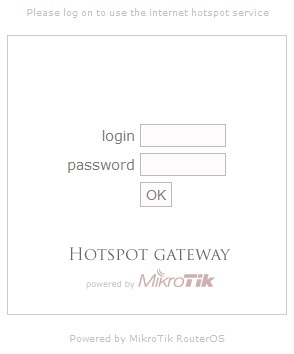 Mikrotik Router has many features, one feature that is quite popular and widely used is Hotspot. We often find wifi internet signals that are in the password. So if you want to access the wifi must know its password first. But unlike Hotspot, most wifi hotspots are not in the password and all users can connect and will be redirected to the login page in Web Browser. Each user can login with a different username and password. This kind of method that we often find in Campus, wifi Cafe, School, Office, and other public areas. Actually, hotspot not only can be applied for wireless network, but also for cable network. 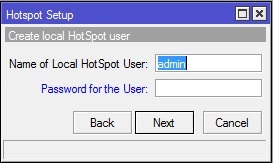 Hotspot advantage is that we can configure a network that can only be used with a certain username and password. We can also do management to these users. For example, set the total duration of use of a hotspot per user, limiting how much data can be downloaded per user, setting what content is accessible to users, etc. 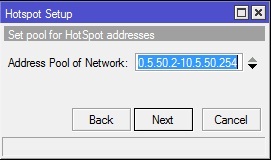 Open in menu IP > Hotspot > Hotspot Setup. By pressing the Hotspot Setup button, Hotspot wizard will guide you to do the settings by displaying the dialog boxes at each step. The first step, we are asked to determine the interface where Hotspot will be activated. In this case, Hotspot is enabled on wlan1, where wlan1 is set as an access point (ap-bridge). Next click Next. 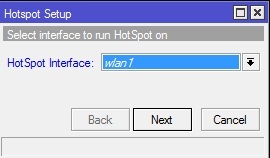 If at interface wlan1 already have IP, then in this second step, automatically filled IP Address which is in wlan1. But if not installed IP, then we can determine its IP in this step. Then Click Next. 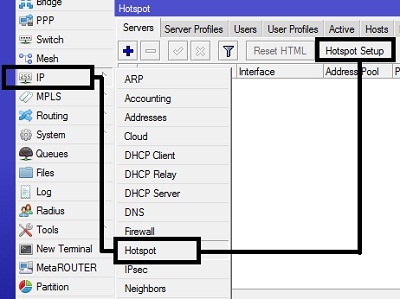 The third step, specify the range of IP Address that will be given to the user (DHCP Server). 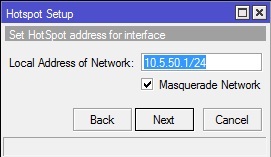 By default, the router automatically assigns IP ranges according to the IP prefix / subnet that exists on the interface. But we can change it if needed. Then click Next. If a special SMTP Server for hotspot servers is specified, each SMTP client request is redirected to the SMTP we specify. Because the smtp server is not provided, IP 0.0.0.0 we leave the default. Then click Next. In this step, we specify the DNS Server address. You can fill it with DNS provided by ISP or with open DNS. For example, we use Google's DNS Server. Then click Next. 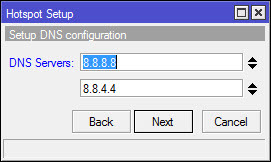 Next we are prompted to enter the DNS name for the local hotspot server. If loaded, later every user who has not logged in and will access to the internet, then the browser will diverted to this login page. Here DNS name should use the correct FQDN format. If not loaded then the login page will use the url of the IP address of wlan1. 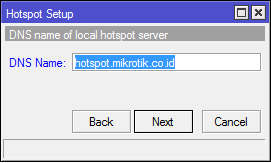 In this case, the DNS name is filled with "hotspot.mikrotik.co.id". Then click Next. The final step, specify the username and password to log into your hotspot network. This is the username we will use to try our hotspot network. 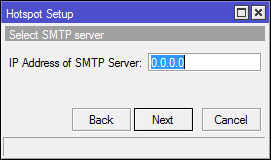 Up to this step, if the Next click will display a message stating that Hotspot setting has been completed. To try it out, please try logging in with the username and password you created in the previous step. 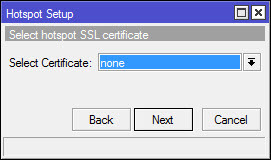 If successful login it will open the requested web page and open the Hotspot status page popup.